It’s not always easy to be the one that steps up and says, “It’s ok. Let me help you with that,” or “I was wrong.” It’s not always easy to be the one that says, “I’m sorry,” first. And it isn’t always easy to be the one that takes the high road by forgiving someone else first. Actually, I would go so far as to say it is never easy. In the business world that is often what you need to do in order to get things done. Arguments, disagreements, and differences of opinion happen often and they can steal a lot of time if someone does not take the initiative to end them. If an argument happens in the office and the two people who are arguing continue it for weeks on end think of all the lost time that occurs. People spend more time talking about the argument at the water cooler. People go out of their way to find out who said what. People in the office waste a lot of time trying to find out what is new in the argument and that wastes time. So, if you are the one that is part of the argument, your managers will appreciate it if you take the first step to end it. It does not mean that you have to take the blame. You can end it by agreeing to disagree. You can end an argument by working out a compromise. You can end an argument by talking it out and coming to a completely new conclusion that has never been thought of before. Or you can end a disagreement by simply walking away from it. 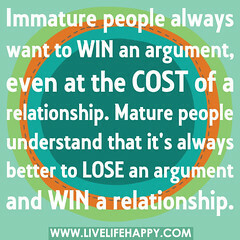 Remember that it takes two to have an argument. Sometimes you can help end a difference of opinion between two other people as well. If it is something that affects the entire team you might want to hold a team meeting and get others to think up ways that the disagreement can be ended where both parties will be happy. You might offer to mediate. Sometimes just hearing something that you have said as it comes from someone else’s mouth can give you a new perspective. When you choose to be the one that takes the high road by ending arguments your managers will notice. They will see how you handle difficult situations. And the result? You will be rewarded for your efforts through things like promotions, raises, more responsibilities, and more exciting challenges.